The guts of insects harbor symbiotic bacterial communities. However, due to their complexity, it is challenging to relate a specific symbiotic phylotype to its corresponding function. In the present study, we focused on the forest cockchafer (Melolontha hippocastani), a phytophagous insect with a dual life cycle, consisting of a root-feeding larval stage and a leaf-feeding adult stage. By combining in vivo stable isotope probing (SIP) with 13C cellulose and 15N urea as trophic links, with Illumina MiSeq (Illumina-SIP), we unraveled bacterial networks processing recalcitrant dietary components and recycling nitrogenous waste. The bacterial communities behind these processes change between larval and adult stages. In 13C cellulose-fed insects, the bacterial families Lachnospiraceae and Enterobacteriaceae were isotopically labeled in larvae and adults, respectively. In 15N urea-fed insects, the genera Burkholderia and Parabacteroides were isotopically labeled in larvae and adults, respectively. Additionally, the PICRUSt-predicted metagenome suggested a possible ability to degrade hemicellulose and to produce amino acids of, respectively, 13C cellulose- and 15N urea labeled bacteria. The incorporation of 15N from ingested urea back into the insect body was confirmed, in larvae and adults, by isotope ratio mass spectrometry (IRMS). Besides highlighting key bacterial symbionts of the gut of M. hippocastani, this study provides example on how Illumina-SIP with multiple trophic links can be used to target microorganisms embracing different roles within an environment. 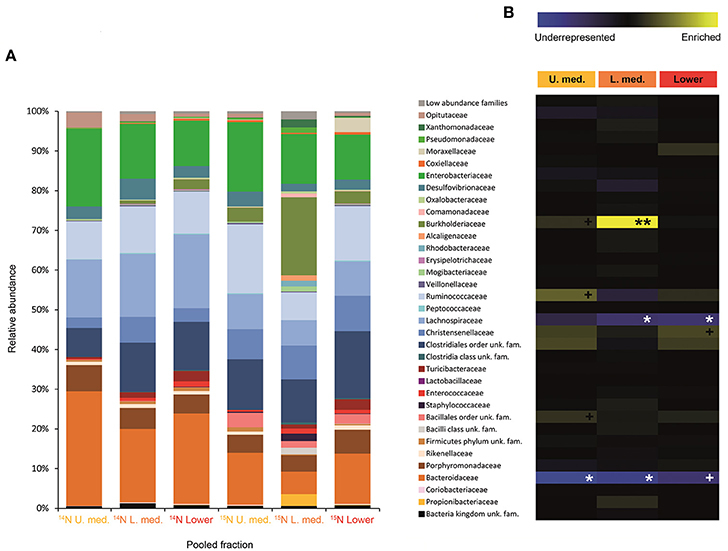 Symbiotic associations between insects and gut-dwelling microorganisms, especially bacteria, have long been known (Baumberger, 1919), but it was not until the development of next-generation sequencing techniques that we realized the true extent of the diversity and complexity of such microbial communities (Shi et al., 2010). Only one major phylotype is present in insects of the Alydae family, whereas termites can harbor hundreds of major bacterial taxa (Engel and Moran, 2013). A relationship between community composition and host insect taxon and diet has been demonstrated (Colman et al., 2012; Jones et al., 2013; Yun et al., 2014; Guerrero et al., 2016), suggesting crucial roles of the symbionts with regard to insect physiology (Potrikus and Breznak, 1981; Douglas, 2009; Watanabe and Tokuda, 2010). Cleveland demonstrated for the first time that termite gut symbionts are essential for the digestion of cellulose and for the viability of the host (Cleveland, 1924). Since then, the contribution of insect symbionts in cellulose digestion (Rössler, 1961; Bayon and Mathelin, 1980; Martin, 1983; Anand et al., 2010) and, more recently, in the recycling of nitrogen (Potrikus and Breznak, 1981; Sasaki et al., 1996; Sabree et al., 2009; Thong-On et al., 2012; Ayayee et al., 2014) have been object of extensive research. In insects possessing specialized hindguts chambers such as termites or scarabaeid beetles, cellulose breakdown occurs thanks to the combined action of host- and microbe-secreted enzymes (Watanabe and Tokuda, 2010; Calderon-Cortes et al., 2012). To which extent the host contributes to the recycling of nitrogen is still unclear; however, a shared pathway has been reported in the cockroach Blatella germanica (Patiño-Navarrete et al., 2014). Nonetheless, the insect digestive tract is a complex ecosystem that renders challenging to relate specific microorganisms to their role within the community. Studies involving bacterial isolation allowed the identification of some cellulolytic and uricolytic bacteria (Bridges, 1981; Anand et al., 2010; Huang et al., 2012; Morales-jiménez et al., 2013), but the lack of culturability of the majority of gut microorganisms and the impossibility of accurately reproducing in artificial media the natural conditions of the digestive tract make cumbersome to assess the real significance of such in vitro observations in an in vivo scenario. The combination of stable isotope probing (SIP) with culture-independent methods of microorganism identification has proven to be a reliable and straightforward approach that allows to link a particular function to specific community members (Lu and Conrad, 2005; Bell et al., 2011; Reichardt et al., 2011; Wüst et al., 2011). By introducing the isotopically labeled substrate of interest into the otherwise unmodified environment, it is possible to disclose an organism's ability to incorporate the heavy isotope into its nucleic acids, thus directly relating certain bacterial taxa to the use of a specific compound (Dumont and Murrell, 2005). In order to increase sensitivity, SIP can be coupled with high throughput amplicon sequencing methods such as Pyrosequencing or Illumina (Aoyagi et al., 2015). This combination has been applied to determine the relevant microorganisms in diverse environments (Paes et al., 2015; Liu et al., 2017) and within the gut of mammals (Berry et al., 2013; Godwin et al., 2014) or insects (Shao et al., 2014). Our object of study is the gut symbiotic bacteria of the forest cockchafer (Melolonthahippocastani), a beetle belonging to the Scarabaeidae family. During its entire life cycle, this insect feeds on living plants, either on the roots during the underground larval stage or on the leaves in the aboveground adult stage, causing significant damage to vegetation during occasional population outbreaks (Jackson and Klein, 2006). The composition of the intricate bacterial community that populates the digestive tract of M. hippocastani remained unknown until the works of Arias-Cordero et al. (2012) and Alonso-Pernas et al. (2017), as previous studies in scarabaeid microbiome focused on other beetles (Egert et al., 2003; Zhang and Jackson, 2008; Franzini et al., 2016) or its closely related species, Melolontha melolontha (Egert et al., 2005). These works have shown that, at the class level, the taxonomic composition of the gut community of M. hippocastani remains constant across the entire insect life cycle, notwithstanding the variation in habitat and nourishment between larval and adult stages (Arias-Cordero et al., 2012; Alonso-Pernas et al., 2017). Since these purely descriptive studies did not allow inference about the function of the gut symbionts, in the present study we combined DNA isotopic labeling with Illumina MiSeq in order to shed some light on the actual role of the gut bacteria in key nutritional processes of phytophagous insects, namely the degradation of cellulose and the recycling of nitrogen. For those purposes, we fed the insects with diet mixed with either 13C cellulose, or 15N urea, a component of insect nitrogenous waste (Bursell, 1967; Ayayee et al., 2014). Considering the constancy of M. hippocastani symbiotic community, we expected to unmask a taxonomic shift in the active microbial players coupled with the transition from larval to adult stage, as a result of adaptation to the radically new diet. By isotope ratio mass spectrometry (IRMS) analyses of host tissues, we aimed to detect the incorporation of 15N from urea into the insect body, thus confirming the existence of a nitrogen-recycling mechanism (Potrikus and Breznak, 1981). Additionally, by introducing the obtained sequencing data of the 16S rRNA genes to the PICRUSt software, which predicts the functional composition of a metagenome using marker gene data and reference genomes (Langille et al., 2013), we produced predictions of the mechanisms that might be behind the above-mentioned processes. Second-instar (L2) larvae were collected in a deciduous forest next to Pfungstadt (Germany, 49°49′44″ N 8°36′17″ E) in June 2016. Adult insects were collected in a deciduous forest next to Hanau (Germany, 50°07′02″ N 8°59′26″ E) in May 2016. Insects were transported to the laboratory in boxes with soil or three leaves. 12C cellulose, 14N urea, and 15N urea were purchased from Sigma-Aldrich (St. Louis, MO, USA). 13C cellulose purified from potato was purchased from IsoLife (Wageningen, The Netherlands). Upon arrival, larvae were transferred to autoclaved sterile plant soil and fed with grated carrot mixed with the experimental compound at a final concentration in the diet of 4 mM (urea) (Ayayee et al., 2014) and 60 mM (cellulose). Optimal cellulose concentration in the diet was estimated based on data from previous labeling experiments with 13C glucose (Alonso-Pernas, unpublished data). Adults were fed with ethanol-sterilized oak leaves overlaid with an aqueous solution of urea or a cellulose suspension at the same final concentrations mentioned above. For each substrate and life stage, a treatment group was fed with isotopically labeled compound, and a control group was fed with unlabeled compound. A group was composed of three insects. Each insect was fed separately in an individual compartment within a climate chamber simulating natural conditions of light, temperature and humidity, for 7 days (urea) and 5 days (cellulose). By using long feeding time we aimed to unveil not only the primary degraders of the substrate, but also the subsequent secondary utilizers that process the derived metabolites (Neufeld et al., 2007; Shao et al., 2014). After feeding, insects were frozen and stored at −80°C until further processing. Before dissection, insects were thawed on ice and surface-sterilized by being soaked briefly in 70% ethanol and sterile distilled water. Dissection was carried out in phosphate-buffered saline (PBS) solution, on ice. Composition of PBS solution used (per liter) is as follows: 8 g NaCl, 0.2 g KCl, 1.44 g Na2HPO4, 0.24 g KH2PO4 (pH 7.4). Whole guts were carefully extracted and dried in a Concentrator 5301 Speedvac (Eppendorf, Hamburg, Germany) at 45°C for 90 min, and then crushed with a sterile pestle. 5 mg of dry powdered gut tissue was used for DNA extraction with the MasterPure™ Complete DNA and RNA Purification Kit (Illumina, San Diego, CA, USA) according to manufacturer's instructions. The concentration and purity of extracted DNA were checked with NanoDrop One spectrophotometer (Thermo Fisher Scientific, Waltham, MA, USA). DNA was stored at −20°C until further processing. CsCl gradients were prepared as described (Neufeld et al., 2007). In short, ~2 μg of purified DNA was mixed with 4.8 ml of 7.163 M CsCl aqueous solution and the corresponding volume of gradient buffer (0.1 M Tris, 0.1 M KCl, and 1 mM EDTA) to achieve a final density of 1.725 g/ml. Solution was transferred to 5.1 ml polyallomer tubes (Beckham Coulter, Brea, CA, USA) and centrifuged in an Optima™ L-90K ultracentrifuge fitted with a NVT 90 rotor (Beckham Coulter, Brea, CA, USA) for 40 h at 173,000 g for cellulose gradients, and 66 h at 150,000 g for urea gradients, as longer centrifugation times at lower speeds enhance DNA separation in 15N-labeled gradients (Cadisch et al., 2005). All samples from the same substrate were set up in the same CsCl batch and run in parallel to minimize potential variations. After centrifugation, 400 μL (cellulose) and 200 μL (urea) fractions were collected drop-wise from the bottom of the tube (total of 12 fractions for cellulose gradients, 24 for urea gradients). The density of each fraction was determined by weighing per triplicate a volume of 100 μL in a fine-scale balance. DNA was precipitated with polyethylene glycol (PEG) 6000 (VWR International, Radnor, PA, USA), washed twice with 70% ethanol and resuspended in sterile double-distilled water. The DNA-density profile for each gradient was assessed using the Helixyte Green™ Nucleic Acid Stain (Bioquest, Bengaluru, India), according to the protocol provided by the manufacturer. The fluorescence was measured with an Infinite F200 PRO plate reader (Tecan, Männedorf, Switzerland), and DNA concentration for each fraction was inferred based on a standard curve. For each experimental compound, equal density ranges showing visible difference in amount of DNA between treatments were selected, and fractions within each range were grouped together in pooled fractions (upper, medium (upper medium and lower medium in urea gradients) and lower) (Figure 1). The 16S rRNA gene copy number for each pooled fraction was determined by quantitative real-time PCR (qPCR) (Lueders et al., 2004) using the 16S rRNA gene specific primers Bact 519F (5′-CAG CMG CCG CGG TAA NWC-3′) and Bact 907R (5′-CCG TCA ATT CMT TTR AGT T-3′) (Stubner, 2002). Reactions contained 2 μL of template DNA, primers at a concentration of 0.3 mM each and 1x Brilliant III SYBR® Green QPCR Master Mix (Agilent, Santa Clara, CA, USA), making a total volume of 20 μL. The program consisted of a 95°C hold for 5 min followed by 40 cycles of 45 s at 95°C, 30 s at 50°C and 50 s at 72°C. PCRs were carried out in a CFX96™ Real-Time PCR Detection System (BioRad, Hercules, CA, USA). E. coli genomic DNA was used to relate quantitative cycle values to the 16S rRNA gene copy number of each reaction (Supplementary Figure 1). In order to correct for differences in amount of recovered DNA and allow comparison between control and labeled gradients, fraction DNA and 16S rRNA gene copy number were normalized as percentage of, respectively, the total amount of DNA or 16S rRNA copy number of all the fractions within a gradient. Figure 1. Distribution of the DNA in cellulose and urea gradients, in larvae and adults. Line chart shows the percentages of total gradient DNA contained in each fraction of control gradient (black line, full markers) and isotopically labeled gradient (gray line, empty markers). Density ranges constituting each pooled fraction are indicated in blue (upper fraction), yellow (medium fraction in cellulose gradients, upper medium fraction in urea gradients), orange (lower medium fraction in urea gradients), and red (lower fraction). Numbers above the line chart show the percentages of total gradient 16S rRNA gene copy number contained in each pooled fraction of control gradient (black square) and labeled gradient (gray square). A stands for activity, tNS stands for number of sequences belonging to a certain taxon, NS stands for total number of sequences. One activity value was obtained for each dense pooled fraction (two for cellulose gradients, three for urea gradients). Identification of taxa that were significantly enriched in dense, labeled pooled fractions (active taxa) was carried out using a Fisher Exact Test with FDR correction in METASTATS (White et al., 2009). The significance threshold was set at p = 0.05, but taxa active with p < 0.1 were also considered for discussion as tending to be significant. Heatmaps representing level of activity were constructed using the MultiExperiment Viewer (MeV) software (Saeed et al., 2003). Phylogenetic trees were calculated using the maximum likelihood method (General Time Reversible model) with 1,000 bootstrap replicates in MEGA6 (Tamura et al., 2013). The bacterial metagenome of medium and lower pooled fractions was reconstructed using the PICRUSt software (Langille et al., 2013), using as the input file a PICRUSt-compatible closed-reference OTU table generated from the above-mentioned open-reference OTU table with the filter_otus_from_otu_table.py script. Non-labeled families were filtered out of the OTU table using the filter_taxa_from_otu_table.py script. 16S rRNA copy numbers per OTU were normalized with the normalize_by_copy_number.py script and IMG database information. The metagenome inference was performed with the predict_metagenomes.py script, using the normalized OTU table as input. NSTI values, a measure of prediction uncertainty, were also calculated (Supplementary Table 1). Certain KEGG Orthologs were selected according to their relationship with the experimental substrate (lignocellulose digestion for cellulose, nitrogenous waste degradation and amino acid production for urea). 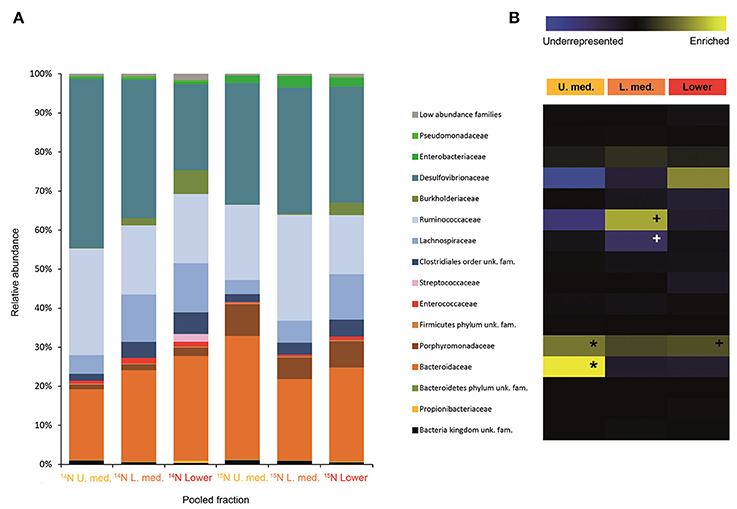 Calculations of the enrichment of KEGG Orthologs in dense isotopically-labeled pooled fractions, reflecting their presence in labeled bacterial families, and construction of heatmaps were done as described above for activity of bacterial taxa. δ values usually are small numbers. Hence, they are commonly multiplied by 1,000 and communicated in ‰units or mUr (Brand and Coplen, 2012). N is the heavy isotope of the element E, R is the ratio of heavy to light isotope (15N/14N) of the sample and the standard, respectively. δNE is the relative deviation of the heavy to light isotope ratio from the international standard (air-N2 for nitrogen). Samples were measured against our laboratory working standard alice-1 (acetanilide, δ15N = –1.44 ± 0.12‰), which has been calibrated for δ15N by a two-point normalization using IAEA-N1 (+0.43‰), and IAEA-N2 (+20.40‰) (Böhlke and Coplen, 1995). Empty tin capsules were used as blanks. A caffeine standard (cafice-1, δ15N = −4.01 ± 0.10‰) was analyzed together with the samples as quality assurance reference material for long-term performance monitoring of the whole analytical setup (Werner and Brand, 2001). δ15N-values of enriched samples are not corrected for m/z = 30 trace (15N2). Since number of biological replicates (n = 3) was too small to test for normal distribution, the statistical significance of differences in δ values was calculated using the Mann–Whitney U test (significance threshold p = 0.05) in Prism 4 software (GraphPad Software Inc., La Jolla, CA, USA). Data are given as mean +/− SEM (Standard Error of Mean). The Illumina raw sequencing data were deposited at the NCBI GenBank Short Read Archive under accession numbers SRR5296204 (12C and 13C cellulose gradients) and SRR5296203 (14N and 15N urea gradients). After centrifugation, between 500 and 1,000 ng of DNA were recovered from the gradients by PEG precipitation. In order to normalize the variation in amount of recovered DNA between gradients, fraction's DNA concentration and 16S rRNA gene copy number are expressed as percentages of total amount within the gradient. For urea, shifting of the DNA toward dense parts (>1.69 g/mL) of the labeled gradient (15N) compared to control (14N) is already observable in the quantification carried out with Helyxyte green. qPCR performed with bacteria-specific primers clarified the increase of 16S rRNA gene copy number in dense pooled fractions (medium and lower) of the isotopically labeled gradient (13C or 15N) in comparison to the unlabeled control gradient (12C or 14N), confirming successful labeling for both substrates (Figure 1). After processing raw Illumina MiSeq data, 145,737 (cellulose larvae) 134,580 (cellulose adults) 367,589 (urea larvae) 531,465 (urea adults) high quality reads were obtained. The sequence analysis showed an increase of the relative abundance of particular bacterial taxa in the dense pooled fractions (medium and lower) of the isotopically labeled gradient (13C or 15N) compared to those in the control gradient (12C or 14N). This indicates the incorporation of the heavy isotope into the bacterial DNA (labeling). Based on the variation in relative abundance between dense pooled fractions of the labeled gradient and those of the control gradient, the activity value of each bacterial taxon for each experimental substrate was determined. In larvae fed on diet supplemented with cellulose, the detected families showing activity were Lachnospiraceae and Enterococcaceae (p < 0.1), Desulfovibrionaceae, Ruminococcaceae, Bacteroidaceae, unclassified families in the order Clostridiales, unclassified families in the class Alphaproteobacteria, Christensenellaceae, and Acetobacteraceae (non-significant) (Figure 2). However, none of them achieved statistically significant labeling (p < 0.05), possibly due to occurence of a strong interspecific competition for the experimental substrate, slow growth and/or usage of other carbon sources besides cellulose. In adults, detected active families were Enterobacteriaceae (p < 0.01), and Enterococcaceae, Desulfovibrionaceae, Ruminococcaceae, and Porphyromonadaceae (non-significant) (Figure 3). The highly significant activity of the Enterobacteriaceae family suggests that, in contrast to larvae, a single family might undertake the degradation of cellulose in the adult gut. Interestingly, no appreciable labeling of the Enterobacteriaceae family was observed in larvae. Lachnospiraceae, the family showing the highest activity value in larvae, is significantly underrepresented in the lower pooled fraction of labeled adult gradient (p < 0.01). This suggests the occurrence of an expected taxonomic shift in the active bacteria across the host's developmental stages. Not all the OTUs could be classified at the genus level. Nevertheless, among the identified genera, the genus Trabulsiella (Enterobacteriaceae family) showed the highest activity in larvae (p < 0.05). In adults, the genus Enterococcus (Enterococcaceae family) had the highest activity, although not statistically significant (Table 1). Maximum likelihood trees of the most active of the identified genera with closely related NCBI retrieved sequences are shown in Supplementary Figure 2. Figure 2. Result of the Illumina MiSeq sequencing of the gradient constructed with DNA from larvae fed on diet supplemented with cellulose (145, 737 sequences in total). The relative abundance of bacterial families in dense pooled fractions of 12C and 13C gradients, in percentage of total sequences, is displayed in (A). The enrichment or underrepresentation of bacterial families in the medium and lower pooled fractions of the 13C gradient compared to the same fractions in the 12C gradient, as a measure of the activity in the processing of cellulose, is shown in (B). Blue represents underrepresentation (inactive families), while yellow represents enrichment (active families). **p < 0.01; *p < 0.05; + p < 0.1. Figure 3. Result of the Illumina MiSeq sequencing of the gradient constructed with DNA from adults fed on diet supplemented with cellulose (134, 580 sequences in total). The relative abundance of bacterial families in dense pooled fractions of 12C and 13C gradients, in percentage of total sequences, is displayed in (A). The enrichment or underrepresentation of bacterial families in the medium and lower pooled fractions of the 13C gradient compared to the same fractions in the 12C gradient, as a measure of the activity in the processing of cellulose, is shown in (B). Blue represents underrepresentation (inactive families), while yellow represents enrichment (active families). **p < 0.01; + p < 0.1. Table 1. Bacterial genera showing the highest activity values among the identified genera in larvae and adults fed on diet supplemented with cellulose. Labeling of certain bacterial families was also accomplished using urea as a trophic link, indicating the ability of gut bacterial symbionts to incorporate nitrogen from the insect's waste compounds into nucleic acids. A high number of bacterial families in the larvae were enriched in the medium and lower pooled fractions of the 15N gradient; following are the ones with higher activities values: Burkholderiaceae (p < 0.01), Christensenellaceae, Ruminococcaceae and unclassified families in the order Bacillales (p < 0.1), unclassified families in the order Clostridiales, Moraxellaceae, Propionibacteriaceae, Xanthomonadaceae, Staphylococcaceae, and unclassified families in the class Bacilli (non-significant) (Figure 4). The detected active bacterial families in the adults were Porphyromonadaceae and Bacteroidaceae (p < 0.05), Ruminococcaceae (p < 0.1), Desulfovibrionaceae, and Enterobacteriaceae (non-significant) (Figure 5). Again, bacteria were differently labeled when comparing larvae and adults, suggesting that the taxonomic shift in active communities also happens in symbionts involved in urea processing. Among the OTUs that could be classified to the genus level, Burkholderia sp. (99% of the Burkholderiaceae family sequences) showed highly significant activity in larvae (p < 0.01). Parabacteroides sp. (99% of the Porphyromonadaceae family sequences) and Bacteroides sp. (100% of the Bacteroidaceae family sequences) also achieved statistically significant activities in adults (p < 0.05) (Table 2). Maximum likelihood trees of the most active of the identified genera with closely related NCBI retrieved sequences are shown in Supplementary Figure 2. Figure 4. Result of the Illumina MiSeq sequencing of the gradient constructed with DNA from larvae fed on diet supplemented with urea (367, 589 sequences in total). The relative abundance of bacterial families in dense pooled fractions of 14N and 15N gradients, in percentage of total sequences, is displayed in (A). The enrichment or underrepresentation of bacterial families in the medium and lower pooled fractions of the 15N gradient compared to the same fractions in the 14N gradient, as a measure of the activity in the processing of urea, is shown in (B). Blue represents underrepresentation (inactive families), while yellow represents enrichment (active families). **p < 0.01; *p < 0.05; +p < 0.1. Figure 5. Result of the Illumina MiSeq sequencing of the gradient constructed with DNA from adults fed on diet supplemented with urea (531, 465 sequences in total). The relative abundance of bacterial families in dense pooled fractions of 14N and 15N gradients, in percentage of total sequences, is displayed in (A). The enrichment or underrepresentation of bacterial families in the medium lower pooled fractions of the 15N gradient compared to the same fractions in the 14N gradient, as a measure of the activity in the processing of urea, is shown in (B). Blue represents underrepresentation (inactive families), while yellow represents enrichment (active families). *p < 0.05; + p < 0.1. Table 2. Bacterial genera showing the highest activity values among the identified genera in larvae and adults fed on diet supplemented with urea. After running PICRUSt, the predicted metagenome of each dense pooled fraction (medium and lower) from the isotopically labeled gradient (13C or 15N) was compared to that in the control gradient (12C or 14N). Heatmaps were constructed showing the enrichment or underrepresentation of KEGG Orthologs dense pooled fractions of the isotopically labeled gradients, as an indication of its presence or absence among isotopically labeled bacterial families. We considered 39 KEGG Orthologs involved in lignocellulose degradation for insects fed with a diet supplemented with cellulose (Supplementary Figure 3). Only the most significantly active families detected by Illumina-SIP were considered in the metagenomic prediction (Lachnospiraceae and Enterococcaceae in larvae, Enterobacteriaceae in adults). KEGG Orthologs involved in cellulose and hemicellulose degradation were the most enriched in labeled lower pooled fraction in both larvae and adults, suggesting that the cellulose-labeled families might be able to process hemicellulose as well. Some KEGG Orthologs potentially involved in lignin digestion were present only in the labeled bacterial family from adults (Enterobacteriaceae). For insects fed with a diet supplemented with urea, we considered 49 KEGG Orthologs involved in nitrogenous waste degradation (uric acid and urea) and in the production of amino acids from ammonia (NH3), the end product of uric acid and urea degradation, along with CO2 (Supplementary Figure 4). Only the most significantly active bacterial families detected by Illumina-SIP were considered in the metagenomic prediction (Burkholderiaceae in larvae, Porphyromonadaceae in adults). The pathways leading to the synthesis of amino acids from free ammonia appear to be enriched in urea-labeled bacteria from adults and larvae, supporting their ability to incorporate waste nitrogen back into amino acids. The uricolytic and ureolytic pathways, however, appear to be only barely enriched in labeled bacterial families from larvae. This brings up the possibility of a cross-feeding between ammonia and amino acid producers. Isotope Ratio Mass Spectrometry (IRMS) measurements of selected insect tissues (gut, fat bodies and muscular tissue) showed the statistically significant incorporation of 15N into the insect bodies of both larvae and adults (Figure 6), suggesting host ability to reuse waste nitrogen in both life stages. Figure 6. 15N incorporated into body tissues of M. hippocastani reared with diet supplemented with 15N urea compared with insects reared with diet supplemented with 14N urea. Results shown are mean values for three replicates per treatment. Error bars represent the standard error of the mean, and asterisks represent statistically significant values with p = 0.05. Symbiotic bacterial families involved in the processing of cellulose were detected by combining data from SIP and Illumina MiSeq. The less evident DNA density shift in cellulose gradients compared to urea is probably due to the lower speed and longer centrifugation time used (Cadisch et al., 2005), coupled with the higher resolution achieved by splitting urea gradients in 24 fractions instead of 12. As hypothesized in the introduction, Illumina sequencing results showed that the taxonomic affiliation of the active community depended on the stage of insect development, and it involved not only dominant bacterial groups but also minor ones. Influence of soil environmental bacteria on the observed shift is negligible, as gut community composition of M. hippocastani larvae shows no overlap with that of the surrounding soil (Arias-Cordero et al., 2012). By feeding the insects during 5 days, we aimed to capture as much as possible of the active community involved in the trophic network of cellulose degradation, not only the primary consumers. When interpreting the results, the limitations of SIP must be taken into account: non-detectable labeling of a certain bacterial family may indicate that they are not able to use cellulose or any of its degradation products, but also it might be a consequence of insufficient label incorporation due to (a) slow growth or (b) reliance on other carbon sources besides cellulose. 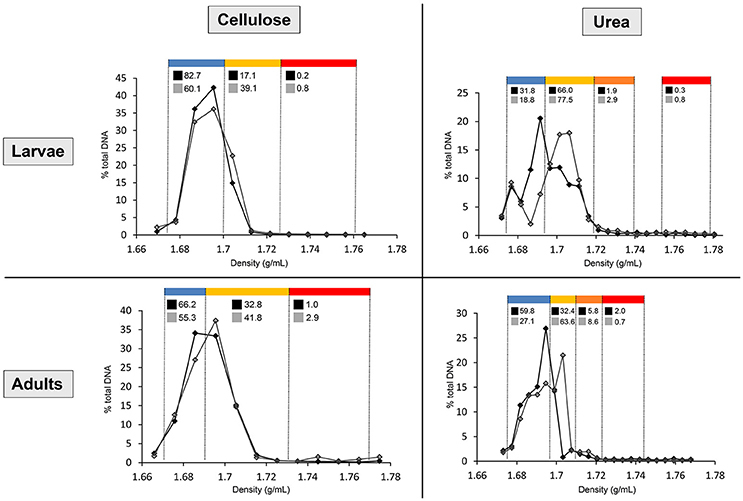 In larvae, the families Lachnospiraceae, Enterococcaceae, and Desulfovibrionaceae showed the highest activities in terms of cellulose processing (Figure 2). These are anaerobic, fermentative families, although some Desulfovibrionaceae and Enterococcaceae members are able to cope with oxygen (Cypionka, 2000; Felis et al., 2015). The Lachnospiraceae family display cellulolytic capabilities (Chatterjee et al., 2015), and its abundance in the gut of the scarabaeid Holotrichia parallela is enriched by woody diets (Huang et al., 2013). Moreover, genomic analyses unveiled presence of butyrate production genes in this family (Vital et al., 2014) and evidence points to them as potential acetogens (Gagen et al., 2015). Thus, the Lachnospiraceae family probably contributes to the fatty acid pool of the gut. Cellulases are produced by Enteroccoccaceae members as well (Shil et al., 2014), and it has been demonstrated that presence of Enterococcus faecalis in the digestive tract increases the amount of food consumed by a beetle host, presumably due to its cellulolytic activity (Schmid et al., 2014). Short-chain fatty acids resulting of fermentative processes, such as acetate, propionate or butyrate, may be absorbed through the gut epithelium, and used by the insect as energy source via citrate cycle or carbon source for the synthesis of fatty acids (Bayon, 1980; Bayon and Mathelin, 1980; Odelson and Breznak, 1983; Terra and Ferreira, 2009). Desulfovibrionaceae might have incorporated some labeling due to cross-feeding interaction with primary cellulose consumers, as reported for termite guts, where members of this family oxidize a variety of fermentation products to acetate (Dröge et al., 2005). Desulfovibrionaceae might also enhance cellulose degradation by balancing the redox potential of the gut content and contributing to the maintenance of anoxic conditions (Bharati et al., 1982; Dröge et al., 2005; Arias-Cordero et al., 2012). Collectively, these observations suggest that the families Lachnospiraceae, Enterococcaceae, and Desulfovibrionaceae might work in synergy in the larval gut, Lachnospiraceae and Enterococcaceae breaking down root organic substrates and making them suitable for the host's digestion, absorption and metabolism, and Desulfovibrionaceae maintaining optimal conditions for this process. Host-produced cellulases released in the midgut may also participate in cellulose degradation (Watanabe and Tokuda, 2010; Calderon-Cortes et al., 2012), although the short residence time of the food in the midgut (4–8 h in M. melolontha) compared to the hindgut (up to 4 days) (Wildbolz, 1954) suggest that the bulk of digestion of recalcitrant compounds is carried out in the hindgut. Although the families Lachnospiraceae and Desulfovibrionaceae are abundant in the larval gut (Egert et al., 2005; Arias-Cordero et al., 2012), Enterococcaceae seems to be minor (Alonso-Pernas et al., 2017). This reflects the role of secondary bacterial phylotypes, which are easily overlooked, in major gut processes such as cellulose digestion. At the genus level, Trabulsiella sp. (Enterobacteriaceae family) showed the highest activity of the identified genera (Table 1). The type species of this genus, Trabulsiella guamensis, shows ability to ferment a wide variety of carbohydrates, including glucose and cellobiose (Janda, 2006), and genomic analyses of five strains of Trabulsiella sp. isolated from the wood-feeding termite Heterotermes sp. showed the presence of an array of cellulolytic enzymes, suggesting their involvement in cellulose degradation within the digestive tract (Olvera-García et al., 2015). 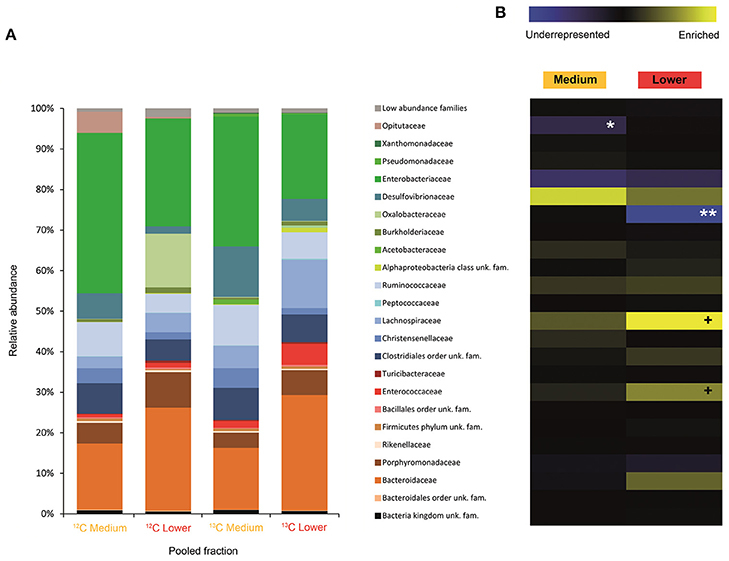 In adults, a much less diverse community made up of exclusively the Enterobacteriaceae family (Figure 3) was significantly active in the processing of cellulose. At the family level, Enterobacteriaceae was not active in larvae. This family, which is commonly associated with herbivore insects, possesses broad polysaccharide-degrading abilities, including cellulose, pectins, xylan and starch (Anand et al., 2010; Adams et al., 2011; Engel et al., 2012), and yield succinate, acetate, H2 and CO2, among other fermentation products (Wüst et al., 2011). As stated before, acetate can be taken up through the gut epithelium and used by the host (Bayon and Mathelin, 1980; Terra and Ferreira, 2009). The involvement of Enterobacteriaceae members in digestive processes during adult stage is not surprising given the increase in abundance of this bacterial family in the adult gut, where it becomes one of the dominant taxa (Arias-Cordero et al., 2012; Alonso-Pernas et al., 2017). The PICRUSt predicted metagenome shows that the Enterobacteriaceae family might be behind the digestion of a wide array of recalcitrant compounds in the adult gut (Supplementary Figure 3). 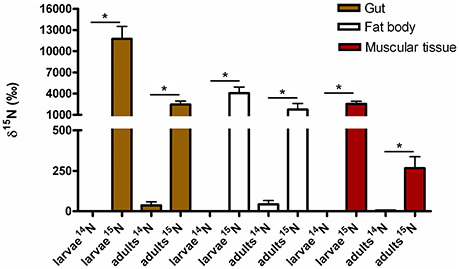 This simplification of the cellulolytic bacterial network in adults compared to larvae may be a consequence of the increased palatability of a foliage-based diet (32 mg lignin/g dry weight, in oak) compared to a root-based diet (128 mg lignin/g dry weight, in oak) (Arias-Cordero et al., 2012). Among the identified genera, Enterococcus sp. (Enterococcaceae family) showed the highest activity, yet it was not statistically significant, suggesting that the most active genus in cellulose degradation within the adult gut may remain unidentified (Table 1). As discussed previously for larvae, cellulolytic Enterococcus spp. are important for the nourishment of the host (Schmid et al., 2014; Shil et al., 2014). Enterococcus mundtii, which is phylogenetically closely related to our Enterococcus sp. (Supplementary Figure 2), has been identified as the most active bacterium in the gut of the leaf-feeding larvae of Spodoptera littoralis (Shao et al., 2014). Urea is a secondary insect nitrogenous waste compound and also a degradation product of the main compound, uric acid (Bursell, 1967; Ayayee et al., 2014). Thus, by using urea as trophic link, we aimed to target not only urea but also some uric acid degraders within the gut symbiotic community. Additionally, because of long exposition to labeled urea (7 days), we expected to extend the isotopic labeling to secondary substrate consumers, namely amino acid producers, for a better understanding of the trophic network behind the recycling of nitrogen. Labeling was successful in both larvae and adults, indicating the ability of gut bacteria to break down urea and incorporate the heavy isotope into their DNA. Also, IRMS analyses detected the significant incorporation of 15N in insect tissues (Figure 6). Taken together, these results strongly indicate the existence of a symbiont-driven nitrogen recycling mechanism in the gut of M. hippocastani, as it happens in planthoppers (Sasaki et al., 1996), termites (Potrikus and Breznak, 1981; Thong-On et al., 2012), and cockroaches (Sabree et al., 2009; Patiño-Navarrete et al., 2014). Isotopic labeling was more prominent and widespread among bacterial taxa in larvae than in adults, which is in line with the lower content of organic nitrogen content in the larval diet (roots) compared to the adult diet (leaves) (Dickson, 1989). In larvae, the Burkholderiaceae family showed the highest activity. The Ruminococcaceae and Christensenellaceae families and the Bacillales order tended to be significantly active at much lower levels (Figure 4). Members of the Burkholderiaceae family are commonly found in association with insects feeding on diets deficient in amino acids, such as wood (Geib et al., 2009) and phloem (Michalik et al., 2016). Tetraponema ants harbor Burkholderiales representatives in a pouch-like specialized compartment surrounded by a network of Malphigian tubules, suggesting the involvement of the bacteria in the processing of insect nitrogenous waste (Borm et al., 2008). The role in nitrogen recycling of the other labeled taxa has not yet been studied, to our knowledge. Nevertheless, their low activity may indicate a cross-feeding interaction in which they take up isotopically labeled ammonia excreted by urea-degrading bacteria and use it as nitrogen source for their own growth (Bryant and Robinson, 1961). At the genus level, Burkholderia sp. (99% of the Burkholderiaceae family sequences) showed a highly significant activity (p < 0.01), pointing it as the most relevant genus within the Burkholderiaceae family (Table 2). This genus has been repeatedly found in the digestive tract of insects thriving on nitrogen-deficient diets (Borm et al., 2008; Grünwald et al., 2009; Kikuchi et al., 2010; Reid et al., 2011; Michalik et al., 2016). Some Burkholderia strains exhibit nitrogen-fixing ability (Estrada-de los Santos et al., 2001), and the genome of a Burkholderia-belonging symbiont encodes complete metabolic pathways for essential amino acids (Shibata et al., 2013). Collectively, these findings suggest Burkholderia sp. as a significant bacterium for the recycling of nitrogen in larval M. hippocastani. A change in the active families between larvae and adults indicates that the taxonomic shift is not exclusive to bacteria involved in cellulose digestion, but also happens to bacteria involved in urea processing. The Porphyromonadaceae family showed the highest activity in adults, followed by Bacteroidaceae. Tendency to be significantly active is observed in the family Ruminococcaceae (Figure 5). An increase in abundance of the Porphyromonadaceae family and the order Bacteroidales, to which Porphyromonadaceae and Bacteroidaceae belong, has been observed in the hindgut wall of M. hippocastani adults compared to L2 larvae. The order Bacteroidales appeared as the most abundant taxon in adult hindgut wall, suggesting a highly significant role (Alonso-Pernas et al., 2017). The Porphyromonadaceae family has been linked to nitrogen fixation in the wood-eating beetle Odontotaenius disjunctus (Ceja-Navarro et al., 2014). Another study on the cockroach Blattella germanica relates low protein content in the diet with an increase in the abundance of this family in the gut (Perez-Cobas et al., 2015). Moreover, a genomic study of a Bacteroidales bacterium, endosymbiont of termite gut protists, unveiled its potential for synthesizing amino acids from ammonia (Hongoh et al., 2008). Taken together, these results suggest the Porphyromonadaceae family as key bacteria under conditions of nitrogen scarcity, with potential to synthesize amino acids. The genus Parabacteroides (99% of the Porphyromonadaceae family sequences) showed the highest activity of the identified genera (Table 2). To our knowledge, no report has hitherto addressed the role of this particular genus within the gut, but our data suggest that Parabacteroides is the relevant bacterial genus in nitrogenous waste recycling in M. hippocastani adults. In second place, the family Bacteroidaceae also showed statistically significant activity. Members of this family might have the genetic potential for the synthesis of amino acids using ammonia from insect waste (Hongoh et al., 2008). In termites belonging to the genus Reticulitermes, Bacteroides spp. (Bacteroidaceae family) are found among the bacteria responsible for producing ammonia from insect nitrogenous waste (Potrikus and Breznak, 1981). In the present study all the Bacteroidaceae sequences belong to Bacteroides sp. Based on these findings, we point the genus Parabacteroides as an important waste nitrogen utilizer within the adult M. hippocastani gut, possibily with the aid of Bacteroides sp. The putative ability of the family Ruminococcaceae to recycle a host's nitrogenous waste remains, to date, unknown. Their low activity makes plausible that they take some of the free ammonia released by primary urea degraders for their own benefit (Bryant and Robinson, 1961). Surprisingly, none of the bacterial taxa displaying highest activity values in this study have been identified so far as primary degraders of uric acid or urea. In termites, the families Clostridiaceae, Enterobacteriaceae, Streptococcaceae, and Bacteroidaceae are responsible for uric acid degradation (Potrikus and Breznak, 1981; Thong-On et al., 2012). The order Clostridiales and the family Enterobacteriaceae showed non-significant activities in larvae and adults, respectively (Figures 4, 5). The family Bacteroidaceae achieved significant activity in adults (Figure 5). In line with these results, the PICRUSt outcome shows that KEGG Orthologs involved in uric acid and urea degradation are barely enriched in the medium and lower pooled fractions of the 15N gradient in both larvae and adults compared to the 14N gradient (Supplementary Figure 4). However, the glutamine synthetase pathway, responsible for the incorporation of free ammonia into glutamate to form glutamine, shows enrichment in both life stages. This might suggest a shared pathway in which urea and uric acid degraders would excrete most of the produced ammonia without incorporating much of the labeled nitrogen, and the bacterial genera discussed above (Burkholderia in larvae; Parabacteroides and possibly Bacteroides in adults) would uptake it for amino- and nucleic acid synthesis. Similar cross-feeding has been reported in a study on the cockroach endosymbiont Blattabacterium cuenoti, which degrades urea into ammonia but lacks the ability to use this ammonia through the glutamine synthetase pathway, which is carried out by the host (Patiño-Navarrete et al., 2014). It must be taken into account, however, that such in silico predictions are limited by the fact that PICRUSt relies on reference genomes, and does not consider processes such as horizontal gene transfer that may reshape the gene pool of symbiotic bacteria (Hansen and Moran, 2014). The microbial community inhabiting the digestive tract of M. hippocastani is very complex and consequently problematic to study. We showed how SIP combined with Illumina MiSeq (Illumina-SIP) can be used to underscore the bacterial symbionts involved in relevant processes for the host, thus narrowing down the number of bacterial taxa in which future research should focus on. Our experiments were limited to cellulose processing and the recycling of nitrogen, but it is possible to address other functions of the gut microbiome by using different labeled substrates, for instance, the active bacteria involved in host detoxification processes could be assessed with labeled plant defense compounds. 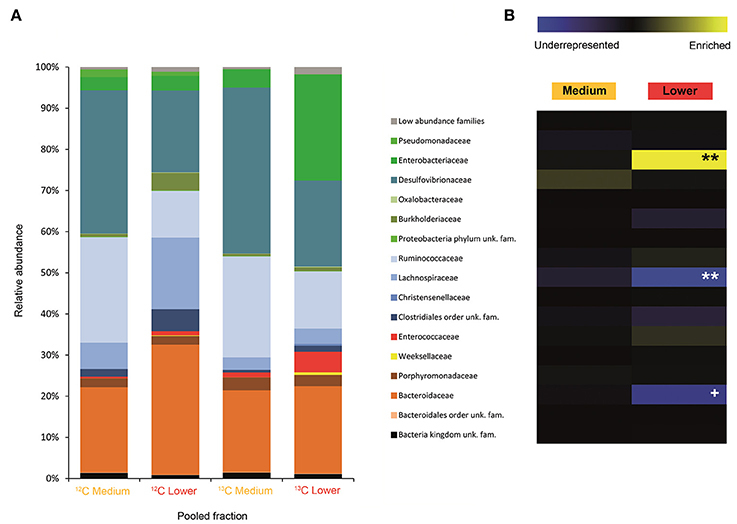 Besides highlighting key microbial symbionts committed to the treatment of cellulose and urea, our data unveiled a shift in their taxonomic affiliation depending on host developmental stage, regardless of the observed community stability throughout the entire insect life cycle. Moreover, low-abundance bacterial phylotypes may be of crucial importance for the gut ecosystem, and PICRUSt predictions suggested possible additional roles for the labeled bacteria, such as production of amino acids and digestion of hemicellulose. This study set up a starting point for research on the function and dymanics of the gut microbial community of M. hippocastani, at the same time it opens interesting questions, such as the elucidation of the molecular mechanisms underlying the bacterial taxonomic shift between host larval and adult stages, the confirmation of the in silico PICRUSt results with metagenomic data and to deepen into the individual roles of the active bacterial phylotypes. Work with insects does not require approval by an ethics committee. PA, EA, AN, and YS designed the experiments. PA and SB performed the experiments. PA, AN, and LH analyzed the data. PA and AN wrote the manuscript. WB conceived and supervised the project. This work was supported by the International Leibniz Research School for Microbial and Biomolecular Interactions (ILRS Jena), the Deutsche Forschungsgemeinschaft (DFG), the Collaborative Research Center (CRC 1127) and the Max Planck Society. The authors want to thank Peter Gawehn, Sabine Weldner and Andreas Weber for their support in insect collection, Angelika Berg for rearing the insects in the laboratory, and Richard Fandino for the proofreading revision of the manuscript. Böhlke, J., and Coplen, T. (1995). Interlaboratory comparison of reference materials for nitrogen-isotope-ratio measurements. IAEA-TECDOC 825, 51–62. Bryant, M. P., and Robinson, I. M. (1961). Studies on the nitrogen requirements of some ruminal cellulolytic bacteria. Appl. Microbiol. 9, 96–103. Chatterjee, S., Sharma, S., Prasad, R. K., Datta, S., Dubey, D., Meghvansi M. K., et al. (2015). Cellulase enzyme based biodegradation of cellulosic materials: an overview. South Asian J. Exp. Biol. 5, 271–282. Cleveland, L. (1924). The physiological and symbiotic relationships between the intestinal protozoa of termites and their host, with special reference to Reticulitermes flavipes kollar. Biol. Bull. 46, 117–227. Felis, G., Salvetti, E., and Torriani, S. (2015). “Systematic of lactic acid bacteria: current status,” in Biotechnology of Lactic Acid Bacteria: Novel Applications, eds F. Mozzi, R. R. Raya, and G. M. Vignolo (New York, NY: John Wiley & Sons, Ltd.) 25–32. Saeed, A., Sharov, V., White, J., Li, J., Liang, W., Bhagabati, N., et al. (2003). TM4: a free, open-source system for microarray data management and analysis. BioTechniques 34, 374–378. Terra, W., and Ferreira, C. (2009). “Digestive system,” in Encyclopedia of Insects, eds V. Resh and R. Carde (Cambridge, MA: Elsevier), 273–281. Wildbolz, T. (1954). Beitrag zur anatomie, histologie und physiologie des Darmkanals der Larve von Melolontha melolontha. Mitt. schweiz. ent. Ges. Berne 27, 193–240. Copyright © 2017 Alonso-Pernas, Bartram, Arias-Cordero, Novoselov, Halty-deLeon, Shao and Boland. This is an open-access article distributed under the terms of the Creative Commons Attribution License (CC BY). The use, distribution or reproduction in other forums is permitted, provided the original author(s) or licensor are credited and that the original publication in this journal is cited, in accordance with accepted academic practice. No use, distribution or reproduction is permitted which does not comply with these terms.